Copyright holders and 3D printer owners don’t like each other for the most part. Once a protected design makes it onto a 3D model site like Thingiverse, it just takes a few clicks to download and print it. It’s a modern version of pirating. Copyright holders don’t receive any compensation for the design and, as a result, often do their best to find and request the takedown of the models. Some companies have gone ahead and offered designs for free to drum up interest among fans, but the vast majority have been slow to adapt to the rise of 3D printers. Shapeways, which 3D prints and ships objects on demand, tested an unusual model: allow a few select artists to sell Hasbro-licensed characters, and split the revenue with Hasbro. The startup opened the option to everyone this week, allowing anyone to create designs that feature classics like G.I. Joe, My Little Pony and Transformers. Designers can also create items for games such as Scrabble and Monopoly. Trivia the Cruciverbalist by Shapeways designer fakebuster83. Photo courtesy of Shapeways. A $30 item would fetch $20 for Shapeways, $6.50 for the artist and $3.50 for Hasbro, Shapeways cofounder and CEO Peter Weijmarshausen told Make Magazine. Items need to be approved before they go live on the Shapeways site, but the fee is handled automatically with each purchase. It’s easy, like it should be. 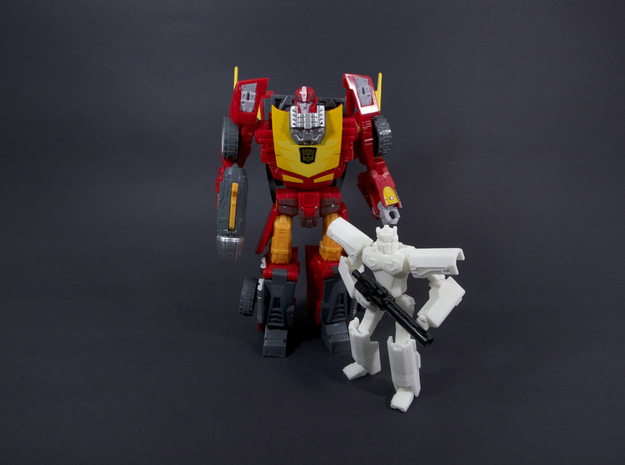 A single artist doesn’t need to negotiate licensing from Hasbro — Shapeways did it for them. That encourages more fans to create content, and as a result there are more options for people looking for something to print. I attended a panel at the Inside 3D Printing conference last year where speakers debated whether 3D printing will have its “Napster moment”: a period where pirated files flow so freely and widely that copyright holders fall into a panic and prompt the government take harsh measures to protect them. iTunes surfaced as a more attractive model. Despite people learning to expect music for free in the early 2000s, iTunes later raked in money from music sales because it just made discovery and purchases so easy. Shapeways is in a very good place to become the iTunes of 3D printing. “Designers can also create items for games such as Scrabble…” Any 3D item in a Scrabble box?